What Is a Rustic Garden? Rustic means appropriate to the country as in plainness or sturdiness. In a modern world that emphasizes the disposable, the mass-produced, and the cheap, the notion of something rustic suggests an authentic, natural, rough-hewn quality that many gardeners crave. Whether it's a vintage garden furniture find at a flea market, a DIY trellis, or a touch of burlap and reclaimed driftwood, rustic gardens always feel cozy and casual, never sleek or manicured. Rustic gardens aren’t defined by any set of rules; rather, a lack of rules and structure seem to characterize many of these outdoor spaces. An otherwise ordinary planting of yellow petunias and other annuals gets a personality injection from a vintage bicycle, which acts as a plant stand as well. Look for bicycles in any condition at the thrift store, and make them rustic garden-worthy with an overall coat of spray paint in periwinkle or chartreuse. Nothing gives you instant farm cred like keeping chickens. A chicken coop provides a practical pest control solution for the garden, as well as adding rustic appeal. Even small urban gardens can accommodate a few chickens, and many city ordinances do permit the keeping of chickens, as long as no roosters are present. Chickens will busily pluck every beetle and caterpillar that you never noticed from flower and vegetable gardens; the fresh eggs are a bonus. Garden landscaping with natural wood is a cornerstone of rustic garden design, and this DIY path made of log slices is an easy project for homeowners that you can accomplish in a weekend. Remove any sod and use a rake to level the area for the path. Use a large band saw to cut log slices into three-inch slices. Install the large slices first, spaced for easy stepping, and fill in the rest with smaller log slices. Backfill the voids with sand and sweep over the surface to stabilize the logs and create a smooth path. Vintage garden wagons, wagon wheels, and wheelbarrows are right at home in the rustic garden. Fill them up with your favorite container flowers and herbs, and add pumpkins and ornamental squashes when fall arrives. A true antique wagon or other farm implement can set you back several hundred dollars depending on the age and condition of the item, but replicas are commonly available and will soon exhibit the patina of an antique in your landscape. What's ugly to one gardener shines with the promise of a creative repurpose to another. A broken-down chandelier may be too far gone to ever illuminate a space again, but the birds don't care when each candle cup becomes a source of nourishment. Nothing is off-limits in the rustic garden when it comes to repurposing, from shabby sheds and junker cars, to old boots or vintage vegetable cans. Burlap is having a moment as a design element, both in and out of the garden. The porous quality of burlap fabric combined with its earthy tone makes it a go-to for wrapping and lining planters or creating grow sacks. Burlap flags, patio seat cushions, and bows or other embellishments add personality to rustic garden spaces at a fraction of the cost of other outdoor fabrics. Choose the right burlap fabric depending on the life you want to get out of the finished product: natural jute will decompose when exposed to weather, while synthetic blends are more durable. 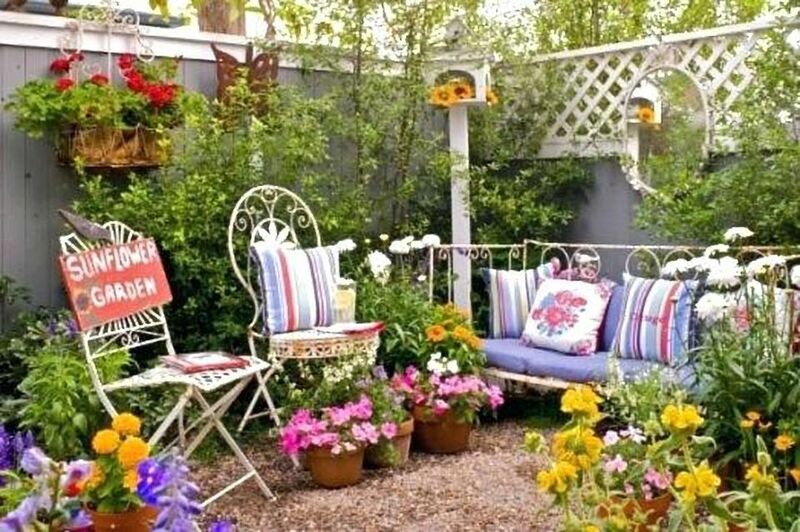 An arbor gives the young garden a sense of place and permanence, and it isn't necessary to spend hundreds of dollars on a rustic arbor constructed from sturdy logs or branches. By leaving the bark intact, you will also provide a purchase for vines to cling to as they grow. If you don't have a ready source of evenly sized logs or branches, willow branches are forgiving and easy to work with, and their flexibility allows you to incorporate curves into your design. Weathered and gnarled pieces of driftwood look at home in the rustic garden as planters or plant mounts, garden art, or integrated into garden gates, birdhouses, and furniture pieces. Those living in coastal areas may be able to harvest driftwood from the shore, especially after a storm, but purchased driftwood pieces are an investment worth protecting with a fine grade matte furniture wax that doesn't contain solvents. Although a polyurethane product will be more enduring than a wax, the glossy shine it imparts does not fit into the rustic garden design scheme. What's Your Garden Design Style?